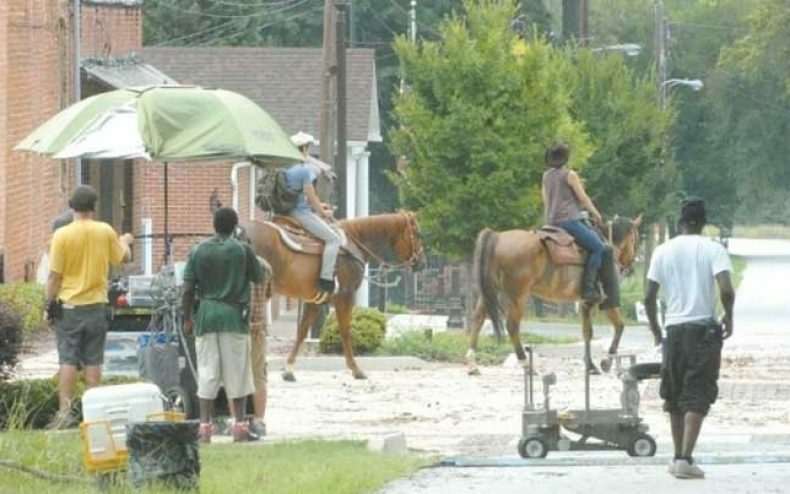 AMC continued filming for season 2 of the hit television series The Walking Dead. Crews were spotted in Sharpsburg filming for what will become season 2, and of course, they filming with a watching crowd close by. AMC began filming earlier this summer and it is expected to continue until this November. The scene that was shot in Sharpsburg was zombie free according to the Times- Herald. The scene featured 2 of the characters of The Walking Dead riding into town onto horseback. The crew filmed their zombie-free scene while reminding on lookers to remain silent during shoots. Locals found it to be quite amusing that AMC chose their area to film, and once word caught wind, the entire town of about 400 people knew what was going on. Sharpsburg is located in Coweta County, which is located in the western part of Georgia. Season 2 of The Walking Dead is set to premier this October 16th on cable television. Season 1, which premiered last Halloween, consisted of 6 episodes and in its short existence captured worldwide audiences. Season 2 will pick up where the last episode left off, “TS-19”, with a season of 13 episodes.